The 1099-INT also captures other tax items related to interest income, such as early withdrawal penalties, federal income tax withheld and foreign tax paid. Applicable businesses: Savings and loan associations, mutual savings banks not having capital stock represented by shares, building and loan associations, cooperative banks, homestead associations, credit unions and other financial institutions. 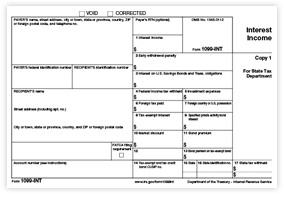 When to file: 1099-INT forms must be mailed to recipients by January 31, and e-filed with the IRS by March 31 each year.